A cat commandeered by TechCrunch tests out the pawprint sensor on the new iPhone 5S. When the first iPhone came out, reviewers worried that the buttons were too small for human fingers. Over the years, that complaint has subsided as people realized that the phone’s touchscreen interface wasn’t so hard once they got the hang of it. For cats, however, it has been a different story. Even as it has upgraded the phone in myriad ways, Apple has ignored the needs of its feline fans, refusing to release a version that the average cat could unlock with its paw. Until now. After commandeering a cat, I tested a colleague’s hypothesis that you could register the identifying skin segments of your favorite furry friends for Touch ID, too. The cat’s paw worked, and while it encountered more frequent failures than did a fingerprint, it was able to unlock the phone again repeatedly when positioned correctly on the sensor. Note that no other paw pads would unlock the device, and that cats essentially have unique “fingerprints” just like people, so this doesn’t make the Touch ID sensor any less secure. 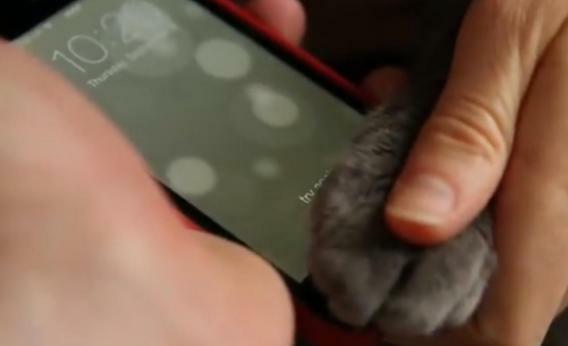 Of course, some cats may find that the phone is still difficult to manipulate once they’ve unlocked it. That’s all the more reason for Apple to include the pawprint sensor on its next version of the iPad, a device that cats have long since mastered.